The new addition to our popular diver-inspired analog chronograph series in clean white 100M Water Resistant and Bi-Directional Rotating Bezel for timing and directional measures make this timepiece practical for any water and sports scenes. The impressive white color also makes it unique and outstanding as a fashion watch. 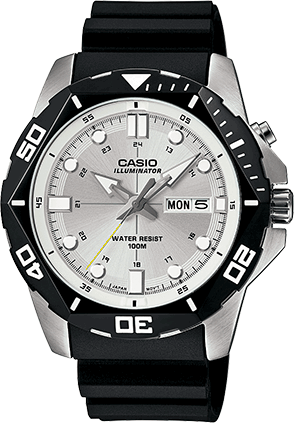 AMW380-7AV is an analog watch with white band and face with black/silver bezel.